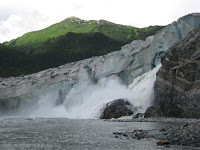 Glaciers along the Gulf of Alaska are enriching stream and near shore marine ecosystems from a surprising source – ancient carbon contained in glacial runoff, researchers from four universities and the U.S. Forest Service report in the Dec. 24, 2009, issue of the journal "Nature." In spring 2008, Eran Hood, associate professor of hydrology with the Environmental Science Program at the University of Alaska Southeast, set out to measure the nutrients that reach the gulf from five glaciated watersheds he can drive to from his Juneau office. “We don’t currently have much information about how runoff from glaciers may be contributing to productivity in downstream marine ecosystems. This is a particularly critical question given the rate at which glaciers along the Gulf of Alaska are thinning and receding” said Hood. Hood then asked former graduate school colleague Durelle Scott, now an assistant professor of biological systems engineering at Virginia Tech, to help analyze the organic matter and nutrient (nitrogen and phosphorus) loads being exported from the Juneau-area study watersheds. "Because there are few reports of nutrient yields from glacial watersheds, Eran and I decided to compare the result from a non-glacial watershed with those of a watershed partially covered by a glacier and a watershed fully covered by a glacier," said Scott. Hood and Scott’s initial findings, reported in the September 2008 issue of the journal Nature Geoscience, presented something of a mystery. As might be expected, there is more organic matter from a forested watershed than from a fully or partially glacier-covered watershed. With soil development, organic matter is transported from the landscape during runoff events. However, there was still a considerable amount of organic carbon exported from the glaciated landscape. How can a glacier be a source of the organic carbon? His curiosity peeked, in spring 2009, Hood's Ph.D. student, Jason Fellman, collected samples from 11 watersheds along the Gulf of Alaska from Juneau to the Kenai Peninsula. The samples were analyzed to determine the age, source, and biodegradability of organic matter derived from glacier inputs. "We found that the more glacier there is in the watershed, the more carbon is bioavailable. And the higher the percentage of glacier coverage, the older the organic material is – up to 4,000 years old," said Scott. Hood and Scott hypothesize that forests that lived along the Gulf of Alaska between 2,500 to 7,000 years ago were covered by glaciers, and this organic matter is now coming out. "The organic matter in heavily glaciated watersheds is labile, like sugar. Microorganisms appear to be metabolizing ancient carbon and as the microorganisms die and decompose, biodegradable dissolved organic carbon is being flushed out with the glacier melt," said Scott. How much? "Our findings suggest that runoff from glaciers may be a quantitatively important source of bioavailable organic carbon for coastal ecosystems in the Gulf of Alaska and, as a result, future changes in glacier extent may impact the food webs in this region that support some of the most productive fisheries in the United States," said Hood.